More than 175 schools in Michigan will join students around the country in observing the 7th Annual Bike to School Day on Wednesday, May 9th. Thousands of Michigan students, along with their parents, teachers, and community leaders, are expected to participate. Wednesday’s event is organized by the Michigan Fitness Foundation (MFF) and the Safe Routes to School (SRTS) program which works to create new, safe routes for children to travel to and from school and thus promote health, wellness, and physical activity. Governor Snyder has officially recognized May 9th as Michigan’s Bike to School Day this year, promoting the importance of physical activity. Bike to School Day reinforces the importance of safety and the development of lifelong physical activity habits in young people. 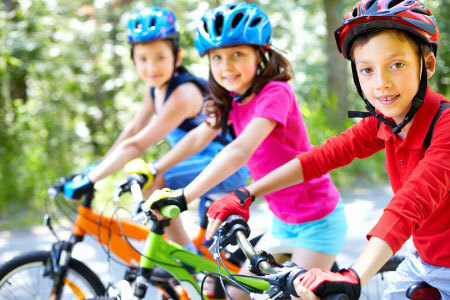 Biking to and from school is an easy way to get the regular physical activity children need for good health. MDOT’s role is to administer the federally-legislated SRTS program, which was established by Congress in 2005. The program evolved in the Moving Ahead for Progress in the 21st Century Act of 2012 and continues under the Fixing America’s Surface Transportation Act of 2015. In addition to Bike to School Day, MFF implements other active living events such as All Children Exercise Simultaneously (ACES Day) in the spring and Walk to School Day in the fall. , Safe Routes to School Director, or visit the Michigan Safe Routes to School website (links to different site in new window).